Help families access critical assistance. Open Doors for Mul­ti­cul­tural Fam­i­lies is a non­profit char­i­ta­ble orga­ni­za­tion ded­i­cated to ensur­ing that fam­i­lies with fam­ily mem­bers with devel­op­men­tal/intellectual dis­abil­i­ties and spe­cial health care needs have equal access to cul­tur­ally and lin­guis­ti­cally appro­pri­ate infor­ma­tion, resources, and services. We provide quality, culturally-responsive services for diverse families of loved ones with developmental and intellectual disabilities and special health care needs. We offer direct, one-on-one support through our bilingual/bicultural Family Support Specialists, and specialized programs to educate and empower persons with disabilities and their families. Olga Lindbom	2018-06-29T11:49:09+00:00	June 29th, 2018|Comments Off on Rate us on GuideStar! Thank you BECU for awarding us Member Volunteer of the Year! 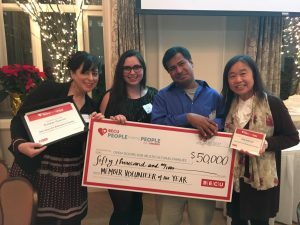 Olga Lindbom	2017-12-21T14:11:04+00:00	December 21st, 2017|Comments Off on Thank you BECU for awarding us Member Volunteer of the Year!